When you think of crochet, you probably think of granny squares and baby blankets. But part of what I love about crochet is how versatile it is, and how it has been brought up to date with some unusual uses. That’s where crochet dishes and baskets come in. The pattern is from Molla Mills’ Modern Crochet – a brilliant book full of quirky, cool designs. I adapted the pattern a little to make the dish, doing fewer rounds to make the shallower shape. This is something my mum asked for to put her watch and bits and pieces in at night, and I think it works really well. 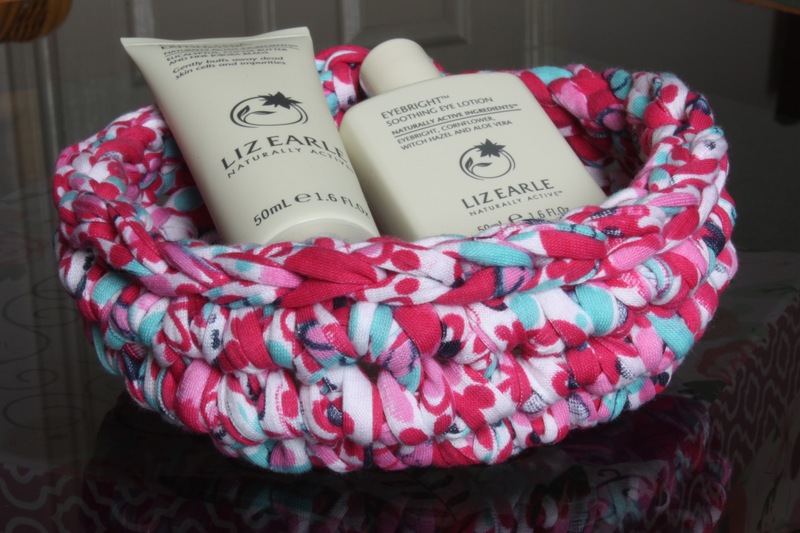 I use Boodles textile yarn to make these baskets and dishes. I have also made a version with Hoooked ribbon yarn, which was softer and made a much smaller basket. I prefer the Boodles yarn as it makes a really rigid dish or basket, and it has a lovely finish. This one is quite loud thanks to the floral pattern on the yarn, but it would also be great in a plain colour for a simpler look. What do you think to crochet homewares? Did you like this post? You can follow me on Bloglovin’.